Brooklyn Chinatown (simplified Chinese: 布鲁克林華埠; traditional Chinese: 布魯克林華埠; pinyin: bùlǔkèlín huábù), which was originally established in the Sunset Park area of the New York City borough of Brooklyn, on Long Island, New York, in the United States, is one of the largest and fastest growing ethnic Chinese enclaves outside of Asia, as well as within New York City itself. Because this Chinatown is rapidly evolving into an enclave predominantly of immigrants from Fujian Province in Mainland China, it is now increasingly common to refer to it as the Little Fuzhou (小福州) or Fuzhou Town (福州埠) of the Western Hemisphere. 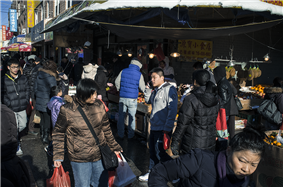 Brooklyn's Chinese population continues to grow and expand highly rapidly, and the borough has since evolved at least three Chinatowns, between Sunset Park, Bensonhurst, and Avenue U in Sheepshead Bay. The New York metropolitan area contains the largest ethnic Chinese population outside of Asia, enumerating 779,269 individuals as of 2013, including at least 12 Chinatowns - six (or nine, including the emerging Chinatowns in Corona and Whitestone, Queens, and East Harlem, Manhattan) in New York City proper, and one each in Nassau County, Long Island; Edison, New Jersey; and Parsippany-Troy Hills, New Jersey, not to mention fledgling ethnic Chinese enclaves emerging throughout the New York City metropolitan area. Chinese Americans, as a whole, have had a (relatively) long tenure in New York City. The first Chinese immigrants came to Lower Manhattan around 1870, looking for the "golden" opportunities America had to offer. By 1880, the enclave around Five Points was estimated to have from 200 to as many as 1,100 members. However, the Chinese Exclusion Act, which went into effect in 1882, caused an abrupt decline in the number of Chinese who immigrated to New York and the rest of the United States. Later, in 1943, the Chinese were given a small quota, and the community's population gradually increased until 1968, when the quota was lifted and the Chinese American population skyrocketed. In the past few years, the Cantonese dialect that has dominated the Chinatowns for decades is being rapidly swept aside by Mandarin Chinese, the national language of China and the lingua franca of most of the latest Chinese immigrants. As the city proper with the nation's largest Chinese American population by a wide margin, with an estimated 557,862 individuals in 2013, and as the primary destination for new Chinese immigrants, New York City is subdivided into official municipal boroughs, which themselves are home to significant Chinese populations, with Brooklyn and Queens leading the fastest growth. Other than New York City taken as a whole, Brooklyn is home to the second-highest Chinese American population of any municipality in the United States, closely following Queens. In the earlier part of the 20th century, Eighth Avenue in Sunset Park was primarily home to Norwegian immigrants, and it was known as "Little Norway", or "Lapskaus Boulevard", as the Norwegians termed it. Later on, as Norwegians left, the neighborhood increasingly became abandoned by the 1950s. In 1986, the first Chinese-American grocery store, Winley Supermarket, was opened on the corner of 8th Avenue and 56th Street by three Chinese immigrants. Selling both Asian and American products, this unprecedented supermarket served the indigenous, predominantly Caucasian residents of the area and attracted Chinese immigrants from all areas of Brooklyn and Manhattan's Chinatown (唐人街, 紐約華埠). By 1988, 90% of the original storefronts on Eighth Avenue in Sunset Park were abandoned, but Winley Supermarket prevailed and continued to draw in more Asian visitors. Chinese immigrants then moved into this area - not only new arrivals from China, but also residents of the Manhattan Chinatown in New York City's Manhattan borough, seeking refuge from high rents, who fled to the cheap property costs and rents of Sunset Park and formed the Brooklyn Chinatown. This relatively new but rapidly growing Chinatown located in Sunset Park was originally settled by Cantonese immigrants like Manhattan's Chinatown. In the past, it had the highest Cantonese population in Brooklyn and resembled strongly of Mott Street (Manhattan's original Chinatown) the entrenched Cantonese community that strongly continues to exist in the western portion of Manhattan's Chinatown. Although large numbers of Non-Cantonese Chinese immigrants, often speaking Mandarin arrived into New York City, they could not relate to the Cantonese populations, which largely don't speak Mandarin or will use it only to communicate with other Non-Cantonese Chinese people. As a result, all of the Non-Cantonese Chinese populations created their own Mandarin Speaking Chinatown or Mandarin Town (國語埠) and a smaller one as well in Elmhurst. This allowed Manhattan's and Brooklyn's Chinatown to continue retaining its almost exclusive Cantonese-speaking society and nearly were successful at keeping its Cantonese dominance. However, in the 1980s and 1990s when an influx of Fuzhou immigrants, also largely speak Mandarin with their Fuzhou dialect arrived into New York City, they were the only exceptional Non-Cantonese Chinese group to largely settle in and fully developed the newer portion of Manhattan's Chinatown on East Broadway and Eldridge Street. Due to many of them having no legal status and being forced into very low paying jobs, Manhattan's Chinatown was the only place where they can receive affordable housing and be around other Chinese people despite the Cantonese dominance that lasted until the 1990s. In the 2000s, gentrification and housing shortages immediately came in Manhattan's Chinatown and with Brooklyn's Chinatown now being the most affordable NYC Chinese Enclave to rent housing, the Fuzhou influx shifted to Brooklyn's Chinatown, however in much greater numbers and supplanting the Cantonese at a significantly higher rate than in Manhattan's Chinatown. Brooklyn's Chinatown is now home to mostly Fuzhou immigrants. During the 1980s and 1990s, the majority of newly arriving Fuzhou immigrants were settling within Manhattan's Chinatown, and the first Little Fuzhou community emerged in New York City within Manhattan's Chinatown; by the 2000s, however, the center of the massive Fuzhou influx had shifted to Brooklyn's Chinatown, which is now home to the fastest growing and perhaps largest Fuzhou population in New York City as well as causing the ethnic enclave to develop more fully and expand much further. Since the 2000s, gentrification in Manhattan's Chinatown has pushed back the growth of Fuzhou immigrants and growth of Chinese immigrants in general, which is why the growing Chinese population in NYC is now primarily centered in Queens and Brooklyn, especially resulting in shifting the primary American destination for arriving Fuzhou immigrants from Manhattan's Chinatown to Brooklyn's Chinatown. The Chinese landlords, especially many of them are real estate agencies in Manhattan's Chinatown are still mainly Cantonese descents and many of them show prejudice not wanting to rent to the Fuzhou immigrants and simply not wanting to deal with them because of concerns that they are very loud, the fear that they will not be able to pay rent since many Fuzhou immigrants are known to be under a lot debt to gangs that helped smuggled them in illegally into the United States, the fear that gangs will come up to the apartments to cause trouble, and  being that they are likely to make the apartments too overcrowded such as subdividing apartments into very tiny spaces to rent to other Fuzhou immigrants, which is possibly another factor of slowing the growth of Fuzhou immigrants in Manhattan's Chinatown. East Broadway, which is the center of Fuzhou culture has the most shocking results of apartment subdivisions into many tiny spaces including so many bunk beds in just one tiny space. With the rapidly growing influx of Fuzhou homeownership in Brooklyn's Chinatown and like many other Chinese immigrants and other ethnic immigrants in general who have become successful homeowners, the Fuzhou homeowners subdivide single-family houses into multiple apartments to rent to tenants. This has opened opportunities as well as led to the Brooklyn Chinatown becoming the new nexus for new arriving Fuzhou immigrants to New York City, to seek landlords of Fuzhou descent and to be able rent an apartment at a lower price in better conditions than in Manhattan's Chinatown with less housing discrimination and barriers imposed on them, in contrast to Cantonese landlords that are more likely to discriminate against Fuzhou immigrants and not wanting them to be tenants in their properties, however there are Fuzhou landlords that can sometimes still discriminate Fuzhou tenants by imposing high rent prices. Many Fuzhou immigrants in Brooklyn's Chinatown have also illegally subdivided apartments into small spaces to rent to other Fuzhou immigrants. Unlike the Little Fuzhou within Manhattan's Chinatown, which further developed the newer portion of Manhattan's Chinatown rather than settling in the center of the Cantonese community of Manhattan's Chinatown and still remains surrounded by areas which continue to house significant populations of Cantonese, all of Brooklyn's Chinatown is swiftly consolidating into New York City's new Little Fuzhou and is beginning to resemble more and more of The New Chinatown of Manhattan, which is the newer portion of Manhattan's Chinatown established by the Fuzhou immigrants primarily concentrated on the East Broadway and Eldridge Street portion. An influx of Fuzhou immigrants caused the price of real estate to increase. More recently, Wenzhounese immigrants from China's Zhejiang Province arrived in Brooklyn Chinatown. Also in contrast to Manhattan's Chinatown, which still successfully continues to carry a large Cantonese population and retain the large Cantonese community established decades ago in the western section of Manhattan's Chinatown, where Cantonese residents have a communal gathering venue to shop, work, and socialize, Brooklyn's Chinatown is now very quickly losing its Cantonese community identity. If Flushing or Elmhurst were more affordable or if the Mandarin speaking populations had settled in a more affordable neighborhood in New York City, very likely the Fuzhou immigrants would have settled largely with the Mandarin speakers and not in Manhattan's and Brooklyn's Chinatowns. This is because the Fuzhou immigrants would have been able to communicate a lot more easily in Mandarin and gotten along with the Mandarin speakers linguistically and likely facing lesser economic and social discrimination, whereas when they were largely settling in Manhattan's and Brooklyn's then Cantonese-dominated Chinatowns, which largely didn't speak Mandarin, they were faced with linguistic discrimination and barriers, which also led to them facing social, cultural, and economic discrimination. This means Brooklyn's and Manhattan's Chinatowns would have continued to permanently retain their Cantonese dominance, but it also means their enclaves would have continued to remain underdeveloped and smaller and possibly have a harder time maintaining the Chinese population. Celebrating Chinese New Year on 8th Avenue. Since the 1980s, the neighborhood has attracted many Hong Kong Supermarket. This Chinatown is also expanding robustly as Chinese businesses are also appearing on parts of 7th Avenue, and east on 9th Avenue. Recently in the community, the issues of overcrowding and more efficient sanitation have been raised. This Chinatown is very well known to be an extension of the original Chinatown in Manhattan. However, that is changing because of the swiftly increasing concentration of the Fuzhou population and the declining Cantonese population; it can very easily be witnessed by the Chinese speaking population that it is increasingly becoming more specifically an extension of the Little Fuzhou on the East Broadway and Eldridge street portion of Manhattan's Chinatown and becoming less of an extension of Manhattan's Chinatown as a whole. Brooklyn's Chinatown is now very quickly becoming the New Little Fuzhou (小福州) or Brooklyn's East Broadway (布鲁克林区的東百老匯), now quickly resembling East Broadway as the main gathering center for Fuzhou residents in Manhattan's Chinatown; or rather becoming Fuzhou Town (福州埠) because it has likely surpassed the one within Manhattan's Chinatown as the largest Fuzhou community in NYC. The Fuzhou population is also spreading into 7th and 9th Avenues and north onto 50th-42nd streets; this segment is also where most of the Fuzhou businesses are concentrated along 8th Avenue as well as on 7th avenue, causing the overall Chinese community to expand even further. Even though the Chinese community is quickly consolidating into a Fuzhou community and there are fewer Cantonese residents residing there, there are still many Cantonese people living in ethnically integrated areas near the Chinese community and still many Cantonese shops between 50th-62nd streets on 8th Avenue; however, the Cantonese presence is definitively giving way to an emerging Fuzhou community, albeit that many Cantonese still come from other parts of Brooklyn and elsewhere to shop on weekends. According to a Daily News article, Brooklyn's Chinatown has surpassed the size of Manhattan's Chinatown and now ranks #1 as the largest Chinatown in NYC with 34,218 Chinese residents, up from 19,963 in 2000, a 71% increase. The Flushing Chinatown (法拉盛華埠) ranks #2 as NYC's largest Chinese community with 33,526 Chinese, up from 17,363, a 93% increase. As with Manhattan's Chinatown, Chinese population has declined by 17%, from 34,554 to 28,681 since 2000. Since Brooklyn's Chinatown emergence on 8th Avenue in Sunset Park, the Chinese population has over the years expanded further into Brooklyn's Sheepshead Bay, Homecrest, Bensonhurst, Dyker Heights, Bath Beach, and Gravesend neighborhoods. Homecrest Community Services, which serves Brooklyn's Chinese population, opened in Sheepshead Bay in the area of Brooklyn's second Chinatown in Homecrest and opened a smaller office in Brooklyn's third new emerging Chinatown in Bensonhurst. This emerging massive Chinese presence in Brooklyn has poured especially into Sheepshead Bay, Homecrest, and Bensonhurst, due to the overcrowding and rising property values in the original Brooklyn Chinatown in Sunset Park. The emerging Brooklyn satellite Chinatowns are primarily dominated by Cantonese populations, but as of the 2010s these enclaves are more scattered and rather mixed in with other ethnic populations. They are extensions of Manhattan's Western Cantonese Chinatown or Little Hong Kong/Guangdong (小香港/小廣東) or Cantonese Town (廣東埠), but at the same time similarly resemble the 1970s-80s of Manhattan's Chinatown when it was still in expansion mode overlapping into other ethnic enclaves. As the Cantonese dissipate from the main Brooklyn Chinatown in Sunset Park, the Avenue U Chinatown and the Bensonhurst Chinatown now carry the majority of the established Cantonese population and continuing to quickly grow in Brooklyn along with new and growing Chinese immigrant population. The second Chinatown and third emerging Chinatown of Brooklyn, along with other emerging clusters of Chinese businesses and people in other parts of Bensonhurst particularly on 18th Avenue and Bay Parkway around the N service, could possibly in the future become the new gathering centers and central business districts for the Cantonese residents in Brooklyn, resembling the western portion of Manhattan's Chinatown in the same way that the main Brooklyn Chinatown in Sunset Park is quickly becoming a gathering center and central business district for the Fuzhou residents in Brooklyn, resembling East Broadway in Manhattan's Chinatown. The developing Avenue U Chinatown (唐人街, U大道). Avenue U in Homecrest now supports southern Brooklyn's second Chinatown (唐人街, U大道), as evidenced by the rapidly growing number of Chinese food markets, bakeries, restaurants, beauty and nail salons, and computer and consumer electronics dealers between Coney Island Avenue and Ocean Avenue. Since 2004, the Q train on the BMT Brighton Line goes to Canal Street in the Manhattan Chinatown (紐約華埠) to Brooklyn's Avenue U Chinatown directly. (The area was formerly served by M, and D trains, both of which went to Manhattan's Chinatown, at Canal Street and Grand Street stations, respectively. This Chinatown is actually a second extension of Manhattan's Chinatown, after the original Brooklyn Chinatown which had developed in Sunset Park. Within a sixteen year period, the Chinese population multiplied by an estimated fourteen fold in the Avenue U Chinatown, which is now in expansion mode. The increasing property values and congestion in Brooklyn's first established Chinatown on 8th Avenue in Sunset Park led to the still increasing Chinese population in Brooklyn pouring into the Sheepshead Bay and Homecrest sections, which in the late 1990s resulted in the establishment of a second Chinatown on Avenue U between the Homecrest and Sheepshead Bay sections. 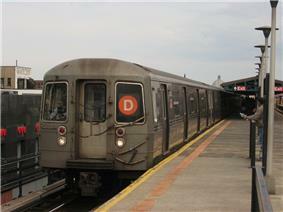 The D service of the New York City Subway system connects Bensonhurst Chinatown (唐人街, 宾臣墟) to Manhattan's Chinatown (紐約華埠). It is also in some way becoming a second extension of Brooklyn's 8th Avenue Chinatown, since transfers between D N trains are easy. On 86th Street, it is home to growing Chinese restaurants including the 86 Wong Chinese Restaurant, which is one of the earliest Chinese restaurants and businesses to be established on this street. Chinese grocery stores, salons, bakeries, and other types of Chinese businesses are also expanding swiftly on this street. There is still currently a mixture of different ethnic businesses and people, especially with many Italians and Russians still in the Bensonhurst neighborhood. However, with the highly rapid rate of growth of Chinese businesses and people on this street, the proportion of the Chinese population is increasing; and this Chinatown may rival or surpass the size of the Avenue U Chinatown. With the migration of the Cantonese as well as Fuzhou people in Brooklyn now to Bensonhurst, and along with new Chinese immigration, other small clusters of Chinese people and businesses have grown in other parts of Bensonhurst like 18th Avenue and Bay Parkway as well integrating with other ethnic groups and businesses. It is possible that several small Chinatowns might form as the Chinese population and number of Chinese businesses continue to grow in various sections of Bensonhurst, as it can be witnessed. According to the Daily News, Brooklyn's Asian population, mainly Chinese, has grown tremendously not only in the Sunset Park area, but also in Bensonhurst, Dyker Heights, and Borough Park. In Bensonhurst alone, from 2000 to 2010, the Asian population increased by 57%. The study also shows that Asians very often live in houses that are divided into studio apartments, which means there is a possibility that the increased Asian population could be more than what the census represents and causing stressors on the growing Asian population in Brooklyn. Chinese translation terms Bensonhurst as 宾臣墟, 86th street as 八十六街, and 18th Avenue as 十八道. ^ a b "A Bluer Sky: A History of the Brooklyn Chinese-American Association". bca.net. Brooklyn Chinese-American Association. Retrieved 2010-10-31. ^ Min Zhou (1992). Chinatown: The Socioeconomic Potential of an Urban Enclave. Temple University Press. Retrieved 2010-11-08. ^ Kirk Semple (2013-06-08). "A guide to the new immigrant enclaves of New York City". The New York Times. Retrieved 2013-06-09. ^ "ACS DEMOGRAPHIC AND HOUSING ESTIMATES 2013 American Community Survey 1-Year Estimates New York-Newark-Bridgeport, NY-NJ-CT-PA CSA". U.S. Census Bureau. Retrieved 2014-11-10. ^ Kirk Semple (June 23, 2011). "Asian New Yorkers Seek Power to Match Numbers". The New York Times. Retrieved 2014-10-03. ^ a b Lawrence A. McGlinn (2002). "Beyond Chinatown: Dual Immigration and the Chinese Population of Metropolitan New York City, 2000". Middle States Geographer 35 (1153): 4. Retrieved 2014-10-03. ^ a b c d Waxman, Sarah. "The History of New York's Chinatown". ny.com. Retrieved 2014-10-03. ^ Semple, Kirk (October 21, 2009). "In Chinatown, Sound of the Future Is Mandarin". The New York Times. Retrieved 2011-06-29. ^ "ACS DEMOGRAPHIC AND HOUSING ESTIMATES 2013 American Community Survey 1-Year Estimates Geographies = New York City, New York". U.S. Census Bureau. Retrieved 2014-11-10. ^ "Yearbook of Immigration Statistics: 2012 Supplemental Table 2". U.S. Department of Homeland Security. Retrieved 2014-03-08. 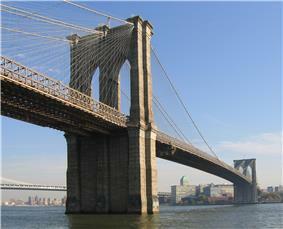 ^ "Kings County (Brooklyn Borough), New York QuickLinks". U.S. Census Bureau. Retrieved 2014-03-08. ^ "Queens County (Queens Borough), New York QuickLinks". U.S. Census Bureau. Retrieved 2014-03-08. ^ Chinatowns of New York City - Wendy Wan-Yin Tan - Google Books. Books.google.com. Retrieved 2013-11-10. ^ "Danes Cook - The New York Sun". Nysun.com. 2007-05-09. Retrieved 2013-11-10. ^ Yarrow, Andrew L. (1991-03-17). "In Brooklyn, Wontons, Not Lapskaus". The New York Times. ^ Peter Kwong (2009-09-16). "Answers About the Gentrification of Chinatown". The New York Times. Retrieved 2012-10-01. ^ Jian-Cuo, World Journal, 9 May 2007, then translated from Chinese by Connie Kong (2007-05-17). "High demand for illegal Chinatown apartments". New York Community Media Alliance. Retrieved 2012-10-01. ^ "Answers About the Gentrification of Chinatown". The New York Times. 2009-09-16. ^ The New Chinese America: Class, Economy, and Social Hierarchy - Xiaojian Zhao - Google Books. Books.google.com. 2010-01-19. Retrieved 2013-11-10. ^ Sweatshop USA: The American Sweatshop in Historical and Global Perspective - Google Books. Books.google.com. Retrieved 2013-11-10. ^ Surviving the City: The Chinese Immigrant Experience in New York City, 1890-1970 - Xinyang Wang - Google Books. Books.google.com. Retrieved 2013-11-10. ^ The New Chinese America: Class, Economy, and Social Hierarchy - Xiaojian Zhao - Google Books. Books.google.com. 2010-01-19. Retrieved 2014-05-04. ^ Sweatshop USA: The American Sweatshop in Historical and Global Perspective - Google Books. Books.google.com. Retrieved 2014-05-04. ^ Wendy Wen-Yin Tan (2008). Chinatowns of New York City (NY) (Then and Now) (Then & Now). p. 10. ^ Contemporary Chinese America: Immigration, Ethnicity, and Community ... - Min Zhou - Google Books. Books.google.com. Retrieved 2013-11-10. ^ Chinatown: The Socioeconomic Potential of an Urban Enclave - Min Zhou - Google Books. Books.google.com. Retrieved 2013-11-10. ^ Semple, Kirk. "In Chinatown, Sound of the Future Is Mandarin." The New York Times. October 21, 2009. Retrieved on May 27, 2010. 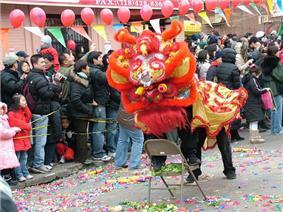 ^ "The changing Chinatowns: Move over Manhattan, Sunset Park now home to most Chinese in NYC". NY Daily News. 2011-08-05. Retrieved 2013-11-10. ^ . "The Call Rundown - All Boroughs". NY1. Retrieved 2013-11-10. ^ . "NYC Info - All Boroughs". NY1. Retrieved 2013-11-10. ^ "HCS | Home". Homecrest.org. Retrieved 2013-11-10. ^ "Italian culture stayin' alive in Bensonhurst". Sfctoday.com. 2010-01-28. Retrieved 2013-11-10. ^ a b c "MTA/New York City Transit Subway Map". MTA. Retrieved 2014-06-12. ^ Ellen Freudenheim (1999). Brooklyn: A Soup-to-Nuts Guide to Sites, Neighborhoods, and Restaurants (2nd ed.). New York: St. Martin's Griffin. p. 103. ^ a b Annie Hauck-Lawson and Jonathan Deutsch (eds.) (2009). Gastropolis: Food and New York City. Arts and traditions of the table. New York: Columbia University. p. 136. ^ Annie Hauck-Lawson and Jonathan Deutsch (eds.) (2009). Gastropolis: Food and New York City. Arts and traditions of the table. New York: Columbia University. p. 136. ^ Sallie Han and Daniel Young (1997-02-07). "AVENUE U EVOLVES INTO MEIN ST., U.S.A.". ^ Michael Cooper (1995-10-22). "NEIGHBORHOOD REPORT: SHEEPSHEAD BAY; New Language, and a New Life, for Avenue U". ^ Wendy Wan-Yin Tan (2008). Chinatowns of New York City. Then and Now. Charleston, South Carolina: Arcadia. p. 10. ^ a b "A Subway Map Remade, in Hopes of Matching Routes and Riders". The New York Times. February 20, 2004. Retrieved June 9, 2014. ^ "MTA/New York City Transit Subway Line Information". Mta.info. Retrieved 2013-11-10. ^ "MTA/New York City Transit Subway Line Information". Mta.info. 2013-08-02. Retrieved 2013-11-10. ^ The New York Times' Book of New York: 549 Stories of the People, the Events ... - Google Books. Books.google.com. Retrieved 2013-11-10. ^ The World in a City: Traveling the Globe Through the Neighborhoods of the ... - Joseph Berger - Google Books. Books.google.com. 2009-06-24. Retrieved 2013-11-10. ^ A Coat of Many Colors: Immigration, Globalism, and Reform in the New York ... - Google Books. Books.google.com. Retrieved 2013-11-10. ^ Let's Go New York City 17th Edition - Google Books. Books.google.com. Retrieved 2014-05-04. ^ Brooklyn!, 3rd Edition: The Ultimate Guide to New York's Most Happening Borough - Ellen Freudenheim, Anna Wiener - Google Books. Books.google.com. Retrieved 2014-05-04. ^ Nelson, Katie (2011-09-15). "Asian boom in Brooklyn along N-line neighborhoods in Brooklyn, Census data shows". Daily News (New York).